BLOOMINGTON, Ind. 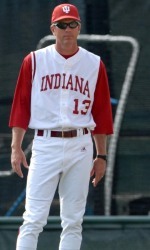 - The Indiana baseball team has released its 2010 schedule, head coach Tracy Smith announced today. The Hoosiers, who open the season in San Diego, will play at least 12 games against teams that participated in the 2009 NCAA Tournament. The Hoosiers open the season with four games in San Diego, in a weekend that will be a homecoming for IU’s four natives of Southern California. Indiana will take on the University of San Diego on both Friday and Saturday, with a doubleheader scheduled for the second day. IU will also play a Sunday contest at NCAA participant San Diego State during the four-game weekend swing. The second weekend of the season sees the second annual Big Ten/BIG EAST Challenge in Clearwater/St. Petersburg, Fla. IU will face off against West Virginia for the second straight year at the Challenge in addition to the first-ever contests against Villanova and Connecticut. The Hoosiers took two out of three games at the 2009 Challenge as the Big Ten won the battle of the two leagues, 15-9. After playing its first game in the state on March 2 at Indiana State, IU then travels to the Music City Classic in Nashville, Tenn., hosted by Vanderbilt. The Hoosiers and Commodores, who faced off at the Louisville NCAA Regional last year, will be joined by Illinois State and NCAA participant Kent State at the weekend event. Following a March 9 trip to face off with NCAA opponent Louisville, Indiana will embark on its Spring Trip, which will take the Hoosiers to Winter Haven, Fla., for the second straight year. Times and opponents are yet to be determined for the trip. After a road game at Morehead State on March 23, IU has its home opener against 2009 Houston Regional participant Xavier on March 24 to begin an eight-game homestand. IU faces St. Francis and Taylor on March 26 and 27, and then Louisville visits on March 30 for the final game before conference play. Indiana opens Big Ten action on Friday, April 2, against Michigan for a three-game set. During Big Ten action, the Hoosiers also play host to Iowa (April 16-18), Purdue (April 30-May 2) and Illinois (May 20-22). Road series include sets at Ohio State (April 9-11), Minnesota (April 23-25), Northwestern (May 7-9) and Michigan State (May 14-16), as Penn State leaves the conference schedule for the 2010 and 2011 seasons. Other non-conference highlights include a trip to Gary, Ind., to face Valparaiso at Railcats Stadium and home games against Ball State (April 6), Indiana State (April 28) and Kentucky (May 11). Other conference road contests pit the Hoosiers against Miami University (April 20) and Evansville (May 18). The Hoosiers will look to return to the Big Ten Tournament for the third straight season after taking the conference title in 2009, the second such championship in school history. IU has never made three straight conference tourney appearances since the tournament’s inception in 1981. The 2010 tournament is scheduled for May 26-30, with the location yet to be determined.